This book will transform your parenting and change the way you interact with your children forever. 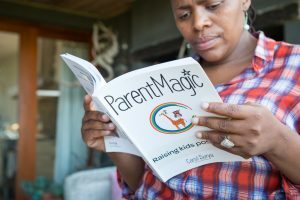 Written by professional children’s wellbeing expert, psychologist Carol Surya, Parent Magic is not just another parenting guide – it’s a life changing experience! Let Parent Magic take you from a place of nagging, frustration and overwhelm to balanced, confident and kind parenting ! “I am a retired remedial school teacher with children and grandchildren of my own. This piece of work on conscious parenting is an extraordinary testament to true parenting with heart! ParentMagic is an awakening for any parent with a child considered ‘difficult’. Until I read this book I did not realize the problem was never my beautiful child, it was and is me. The book shows you this in a caring and gentle manner. It showed me that my child is my mirror. Its the gentle wise friend you wish you could have with you 24/7. This book just like the bible, in my opinion, needs to be read everyday.